Lindberg's Violin Concerto of 2006 (...) manages to balance substance with style, and poetry with virtuosity, in ways that can almost stand comparison with Berg (...). Credit to the Tapiola Sinfonietta and Ondine's excellent recording. 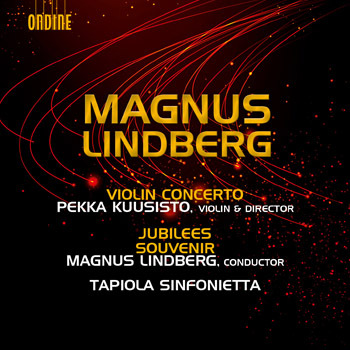 Ondine continues its collaboration with Magnus Lindberg by presenting the recording of his Violin Concerto featuring Pekka Kuusisto, and the world première recordings of his chamber orchestra works Jubilees and Souvenir. Magnus Lindberg's music is always instrumentally idiomatic and powerful. The soloist part in the Violin Concerto is demanding, yet gratifying, and rich. Jubilees is an adaption of earlier piano miniatures and Lindberg made them resemble the original as closely as possible, yet illustrating the dimensions of instrumental thinking and transforming them into an idiomatic large chamber ensemble texture. Premiered in New York in 2010 Souvenir, a kind of homage to Gérard Grisey and Franco Donatoni, ranges musically from chamber-music lucidity to an almost Romantic orchestral opulence. Internationally renowned violinist Pekka Kuusisto is recognised for his fresh approach to the repertoire and for being a strong advocate of new music. On this recording he appears as soloist and director of the Tapiola Sinfonietta, an orchestra with which he works together on a frequent basis. The Tapiola Sinfonietta, founded in 1987, emphasises the vital role of each musician and represents uncompromising quality, be it in the music of the Viennese-Classical period, modern classics or contemporary music. Their broad discography includes many critically acclaimed CDs. Magnus Lindberg, known in the first place as composer, has always been inspired by instrumental qualities and by the elements of musicianship and performing. Appearing as pianist on an earlier recording of his chamber works (ODE 1199-2), he appears for the first time also as conductor of his own works on this release. Between 2009 and 2012 Lindberg was Composer-in-Residence of the New York Philharmonic, with new works including Souvenir among others.